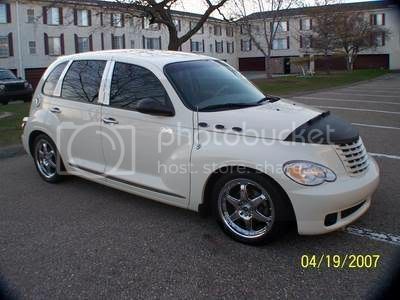 I'm in the process of getting my first PT Cruiser and I'm so excited!!! However, I cannot decide whether to get the 2006 Base or the 2006 Touring Edition. It seems to me they're practically the same but come with a price difference of $1,600. Could someone please tell me whether it's worth upgrading to the Touring Edition or whether the Base is just good enough? Go here and at the left side bottom click on build and price, once there you can compare the differences between the two. Happy shopping. The touring has more options standard including air conditioning, power mirrors, plus several other things. No one can tell you if they are worth the extra cost. Check out each PT carefully then decide if it is worth it to you. I just turned in a 04' base model for a 06' Touring Edition. The Touring model has some extra features. It has power locks, power mirrors, lighted vanity mirrors, temperture gauge, electronic messege center (avg. mpg, mile to empty), six speaker sound system, cruise control and headlight timer. I looked at getting another base model but after driving the Touring I had to have it. I didn't mind the few extra dollars per month for it. Good luck with your choice. No, all USA PT have the 2.4 l engine. both Base and Touring have the non-turbo. IXNAY. In '04 you could get the Lite in the Touring, not in '05 - turbo Lite was only in Limited for '05.